Blaque: On today’s author spotlight, I’m taking a trip down south to Houston, Texas. I have the pleasure of speaking with Annette Whitaker-Moss. Annette: It is nice to meet you Blaque Diamond. Blaque: It is nice to meet you as well. So, are you originally from Houston? Annette: Yes, I grew up in Houston, Texas. Blaque: Nice. So, what do you write? Annette: I am a poet and author. I have been writing poetry since I was young. Blaque: Awesome! I write poetry as well, and I write what I consider contemporary African-American fiction. I’m sure your poetry expresses your joy, faith, pain, and love throughout each and every word. So, I want to let readers get to know more about the woman behind the poetic proses. Annette: Great! I have a lot to tell my readers about myself. Blaque: As we all do. It’s nice sometimes to pull off the professional attire and put on some lounging clothes to relax in. That’s the kind of scene I like to paint, so author’s can be themselves and open up to their readers. So, tell me, what makes you uniquely you? Annette: What makes me uniquely me is my sense of humor and the truthfulness and sarcasm within it. Once a person understands my personality, I am then recognized as a very good friend. Blaque: Do you prefer writing your first drafts on paper or the computer? Why? Annette: I prefer writing my first drafts on the computer because it’s neater, faster in correcting errors, and easier to add or delete, if desired. Annette: Most of my story ideas come from life experiences of myself and others sharing what they have gone through. Blaque: Yes, I can definitely agree to that. What I write, I’m sure someone in this big ole world has experienced before, even if I don’t know them personally. That’s why readers can relate to my work so well. It’s reality. So, what advice would you give someone who aspires to be an author? Annette: I tell everyone I know who has a passion for writing to always write their thoughts and ideas down on paper or the computer, because that’s what writers do, they write. The goal is to keep writing and creating. You can always organize, edit, etc., if you have a starting point. Publishing and marketing is a whole lesson on its own, but you can’t start publishing unless you have written something down. So, keep writing! Blaque: That is some sound advice you gave. My zodiac sign is Virgo, what is your zodiac sign? Annette: My zodiac sign is Sagittarius, which has a suggested personality of high purpose, creativity and ambition. I can truly say that I fit all three categories. Blaque: If you were trapped on a desert island and could bring only one person, who would it be and why? Annette: If I was trapped on a desert island, I would bring my BFF, because we have weathered many storms together. Our faith and strength are in God. Through him, all things are possible. The two of us would encourage one another and survive any ordeal we encountered. Annette: My other talents, as a teenager, was oil painting and playing the piano. I haven’t done much of either lately since I started writing, but I still have a passion for both. Someday, when time permits, I would like to start again painting and playing the piano. Blaque: Hmm . . . Interesting. As a teen, my talent was drawing. I could practically duplicate almost anything I wanted by just looking at it. I do miss drawing, but I now draw pictures with my words instead. I know I’m guilty of this, but have you ever used people you know as characters in your books? Annette: Yes, my first novel, Good Kid in Trouble was based on true events that happened in my son’s life while he was in middle school. Things are so different from when I was in school. In this day and time, I felt it was a story that needed to be told. Annette: My all-time favorite movie is Pretty Women with Julia Roberts and Richard Gere. You never know how God will deliver a blessing, so people must be careful in how they treat others. Blaque: We all have things that we are afraid of, so tell me yours. What is your biggest fear? Annette: I am directionally-challenged. My biggest fear is being lost. I will break out in hives when I can’t find my way to any desired location. And, that’s with using the GPS. It’s ridiculous! Blaque: Well, that certainly is a justifiable fear. I’m sure no one wants to be lost. So, I see you mentioned earlier that you have a BFF. Annette: The worst writing mistake I made was not having my first book of poetry professionally edited. Although the mistakes were minimum, the price to correct them was costly. Annette: When I am not writing, I love to swing dance in my spare time. I’m not that good at it, but I love trying! Blaque: Wow! Swing dancing? That’s definitely something different. I’m not sure I’m brave enough to try it though. Lol. As children we all dream of what we want to be when we grow up, so what did you want to be when you grew up? Is that the occupation you’re in now? Annette: I wanted to be an accountant when I grew up. I earned my Bachelor’s Degree in Business. I did not become an accountant, but I have always worked in the accounting field. Annette: Writing is like a second job for me. Unfortunately, writing has not paid the bills, but my time is coming when writing will be my full-time job. That is the goal! Annette: I am not really an animal lover. However, I’ve had two dogs in my lifetime that I really loved and felt loved in return. My last dog was named “Missy”. I had her for seventeen years. We had to euthanize her two years ago. Blaque: How does it make you feel when a reader tells you that they enjoyed reading your books? Annette: I am so amazed when a reader tells me they enjoyed reading my books. I really feel blessed to know that someone else can relate and enjoy my poems and/or stories. The feedback really keeps me motivated. Annette: My goal as an author is to be an inspiration to my children, nieces, and nephews. I want them to know they can do or be anyone they want, if they work hard and believe in themselves and whatever it is that they want to do. As a writer, I want to write a best-seller that can be made into a play and/or a movie. Blaque: As authors, I think we all would like to see our books performed on stages and broadcasted on the big-screen, including myself. What has been the hardest hurdle you had to jump over while embarking on your writing career? Annette: I think most authors would say marketing is the hardest hurdle one has to jump over in this career. It has certainly been the hardest for me. I rather write than market, but you can’t really be successful without doing both, unless you write strictly for fun. Blaque: I agree 100%. Marketing is definitely the hardest hurdle I am having to jump over. Once I really find my audience though, I feel things will level themselves out. As an author, we are also readers, so what is your all-time favorite book? Annette: Sybil, written by Flora Rheta Schreiber in 1973. I am simply fascinated with multiple personality’s stories. Sybil was the first one that I read. It was the beginning of my love for identity disorder stories. Blaque: Well, we have come to the end of another interesting and informative author spotlight interview. I enjoyed getting to know Annette just as much as I’m sure the rest of you did. Annette: it was a great opportunity for me to open up and let my readers see the layers that make me who I am. Blaque: Well, you know we can’t end things without giving readers a chance to check out your work. So, where can your books be found? Annette: Of course not. This is promotion isn’t it? Lol. Annette: My book of poetry entitled One Heart to Another can be purchased as an EBook and paperback from Amazon and other retailers and my novel Good Kid in Trouble can be purchased from Amazon as an EBook. Blaque: Do you have a website? 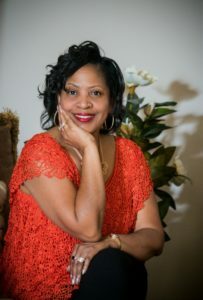 Annette: Yes, readers can visit my website to purchase my published books, see up-coming events, and learn more about me and my writing by visiting Annette Whitaker’s Website. Blaque: Ok, nice. Where can readers find you on social media? Annette: I am on Facebook, Twitter, and Instagram. Readers can feel free to follow me to keep up with the latest of my writing journey. Blaque: Thank you so much for the opportunity to speak with you today. Annette: Thanks so much for having me. It was nice to relax and take a load off. Blaque: Lol. My pleasure. Until next time. Happy writing.